Dave Morgan suggests some diary dates for visiting local gardens this summer. The words “Make an appointment” can strike terror into the hearts of people who are scared of visiting dentists or doctors – but making an appointment can also mean getting ready for something exciting. One example is making an appointment to visit one of the wonderful gardens in our area open this year for the National Gardens Scheme – and there are plenty worth visiting! One of my personal favourites is Pump Cottage in Weatheroak – a garden full of character and interest, described by one visitor as “a secret wonderland with surprises at every turn”. 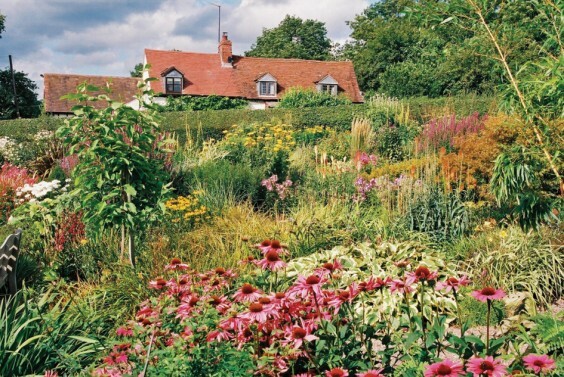 This is a garden ideal for “plantaholics” and is attached to a 19th-century cottage in a rural setting with a real surprise at the bottom of the garden! There are colourful borders, a fernery and bog garden, water features, artefacts, follies and several paths that all lead, eventually, towards the surprise – a large natural pond with a walkway around it and plenty of wildlife. Garden owner Barry Knee calls it a pond, but I would call it a small lake! There is even a boat, and in the conservatory is a picture of Carol Klein of BBC’s Gardener’s World in the boat with Barry, when she visited as part of a BBC programme on joining the NGS. Pump Cottage is normally open two or three times a year but for personal reasons Barry and partner Sue are only opening this year “by appointment”, from April 1 to September 30. They always say they will open, if they are about, even for one or two visitors, so no need to arrange a large party – but it’s more fun with a group as you keep meeting each other whilst exploring hidden areas of this enchanting garden! A garden that’s totally different is the grounds of Hewell Grange in Tardebigge. There can’t be many prisons that open their grounds to the public, but we are lucky to have access to this particular one on May 18 and 19. But be fast – you MUST book a place on one of the guided tours in advance, and if last year is anything to go by, they will go very quickly. To book, call Alison Bramham on 01527 785050. Hewell Grange’s grounds are fascinating – but not a “flower garden”, though there are rhododendrons, azaleas, a rock garden and walks around the lake and bluebell wood. Tours last about an hour and visitors are told the history of the buildings (the ruins of the original one are still standing) and the landscaped park, laid out by “Capability” Brown and modified by Humphry Repton in 1812. Slightly further afield is Meadow Farm in Feckenham – well worth a visit if you can get at least 20 people together, as it consists of a one-acre garden with a one-and-a-quarter-acre wildflower meadow and an excellent three-quarter-acre nursery that is not normally open to the public. Meadow Farm (pictured above) is open from May 18 until mid-August. Finally, if you cannot manage to get 20 people together to visit Meadow Farm, but can muster a group of 10, then Marlbrook Gardens continues to be a very popular choice. Here three gardens are open within a short walk of each other, and show off three totally different styles. The first is a steeply terraced garden built in an old sand quarry which has pools, a stream, waterfalls, a roof garden with access via a spiral staircase off the patio and a huge variety of plants including many exotics, with some in a hot house and a separate large glass house. Three doors down is a more traditionally laid-out garden that also includes a Mediterranean patio, a large pond with a bridge over it, lawns, herbaceous borders, and at the top a large vegetable patch in neatly-raised beds, and again an abundance of plant varieties with yet more exotics. The third garden, which is a short walk away, is a plantsman’s (or in this case plantswoman’s) cottage garden with hardly a bare piece of soil to be seen. In addition there are more water features, two ponds, a small waterfall, numerous statues and artefacts around the garden, and also a small collection of paintings by the owners on display in the conservatory. If you cannot find nine people to accompany you, don’t worry as Marlbrook Gardens will have four open days for anyone to visit. More details of these and all other Worcestershire gardens open this year can be found at http://www.ngs.org.uk or in the Yellow Book, available at most book retailers, or from the yellow Worcestershire leaflet, free from most garden centres, libraries and tourist information centres. So enjoy your appointments as you visit the great gardens in our area!